Here’s a little Christmas tree pattern for you, my friends. I made it with a series of combination back post treble crochet stitches. It may seem a little tricky at first, but I know you can do it. 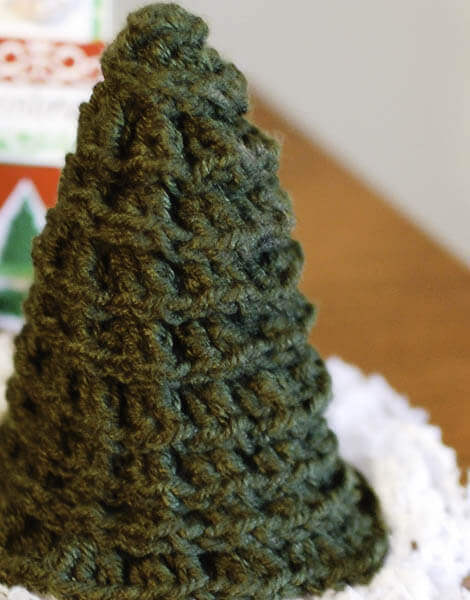 I called the stitch a “Fir stitch” for the sake of this pattern, but it may technically be called something else in the crochet world. Hope you enjoy it! Special Stitches: Fir stitch: Work 1 BPtr around specified stitch, work 2 dc around post of tr st just made. Back post treble crochet (BPtr): Yarn over twice, insert hook around post of specified stitch, working from back to front to back, and pull up a loop (4 loops on hook), yarn over and pull through 2 loops, yarn over and pull through 2 loops again, yarn over and pull through remaining 2 loops. The tree is worked in continuous rounds; do not join after each round. Round 1: Ch 1 (does not count as st), work 6 sc in ring — 6 sts. Round 2: Ch 1 (does not count as st), work 1 dc in each st around — 6 sts. Round 3: Work 1 Fir st around each dc of previous round — 6 Fir sts. Round 4: Work 1 Fir st around the tr of each Fir st in previous round — 6 Fir sts. Round 5: *Work 1 Fir st around the tr of the Fir st of previous round, work 1 Fir st around the 1st dc in that same Fir st of previous round, work 1 Fir st around the tr of the next Fir st of previous round, rep from * around — 9 Fir sts. Rounds 6 and 7: Work 1 Fir st around the tr of each Fir st in previous round — Fir 9 sts. Round 8: *Work 1 Fir st around the tr of the Fir st of previous round, work 1 Fir st around the 1st dc in that same Fir st of previous round, work 1 Fir st around the tr of each of the next 2 Fir sts of previous round, rep from * around — 12 Fir sts. Rounds 9 and 10: Work 1 Fir st around the tr of each Fir st in previous round — 12 Fir sts. Round 11: *Work 1 Fir st around the tr of the Fir st of previous round, work 1 Fir st around the 1st dc in that same Fir st of previous round, work 1 Fir st around the tr of each of the next 3 Fir sts of previous round, rep from * around — 15 Fir sts. To finish off, ch 2 and Sl st into next st to join. Fasten off and weave in ends. You can find more of my free Christmas and Holiday patterns by clicking here. Hi, I love this pattern! I am wondering if the dc part of the fir stitch is also back post, or is it front post? I am going to assume back for now. I am also wondering if you join any of the rounds. I am assuming not, but i thought I would ask. Ooo, I really like this pattern! I need to pin it for next year. Nice job, Kara! Thanks for sharing at Hookin On Hump Day! Your skills continue to amaze me!! Adorable! 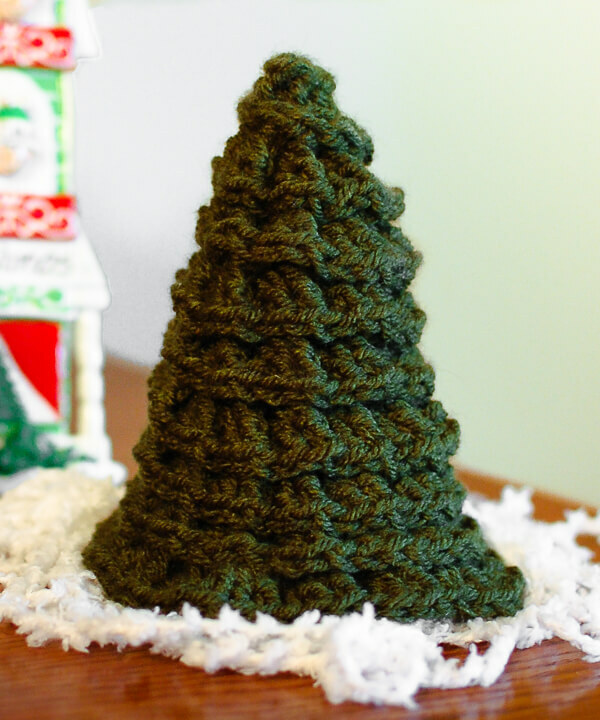 This would make a great kid’s room tree for them to decorate with little ornaments! Thanks for sharing!